Overview: In Modesto, California, as the end of the summer of 1963 approaches, the boys have one more night on the town before heading off to college. It’s summer of 1963 and four boys, some of which are heading off to college the next day, get together and go off on their own to do what they usually do: cruise the main streets in their gorgeous souped-up cars, get someone of age to buy booze for them, go to the sock hop, meet a girl… just plain old have a good night. American Graffiti is a feel-good, warm-hearted, and innocent slice-of-life tale, but I don’t like slice-of-life nothing-happening tales. Bringing out the Dead had a boredom’s pace. Mean Streets, in spite of its hint of plot still hurt me a little. The Best of Youth covered a span of decades and even though we see the results of earlier ‘slices’, it’s still fundamentally a plotless day-in-the-life type of story. The introspective of a year known as The Last Picture Show? No thank you. Don’t even talk to me about the idle waste of film that is Jarmusch’s Permanent Vacation. George Lucas did something different with American Graffiti though - he showed me the sort of idle “Boys Will Be Boys” evening out that I wanted to see, and added an era that I’ve never known to spice it up. He made cruising around super cool. Talk about an ensemble cast for an ensemble tale. Richard Dreyfuss plays the impressionable and aimless Curt, who, while driving around sees the girl of his dreams and spends the rest of the night looking for her, all while getting into trouble with the local brylcreamed Pharaohs gang, escalating his antics throughout the night. There’s Steve Bolander (played by a Ron Howard that looks and acts so much like Archie that I looked up who came first) and his girlfriend Laurie (the ever-cute Cindy William of “Happy Days” and “Laverne & Shirley” fame), whose first conversation of the evening is about dating other people while Steve’s away at college. The two are inextricably bound to this topic and its related tumultuous emotions for the rest of the night. There’s John Milner (Paul le Mat), the mechanic with a custom ride who isn’t going away to school tomorrow. 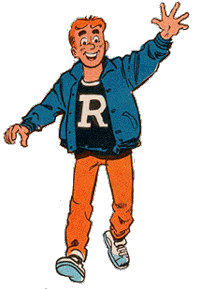 He’s the kind of guy who puffs himself up and talks big but who is also obviously sick of constantly defending his title of ‘best drag racer’ with his tweaked-out, beautiful 1932 Deuce Coupe. His story involves accidentally picking up a 14-year old Carol (Mackenzie Phillips) and reluctantly allows her to tag along. There’s some amazing scenes with Harrison Ford who plays a small role still very early on in his career as Bob Falfa, the driver of "a very wicked '55 Chevy" lookin' for John to have a drag race. Finally, the fourth evening we explore is that of Terry the Toad (Charles Martin Smith of The Untouchables & Deep Cover). He gets loaned Steve’s incredibly exquisite 1958 Chevy Impala, cruises around and picks up a cute little chickie, introducing himself to her as Terry the Tiger. The little white lies build up from there. As slice-of-life stories go it’s one of the better ones, it’s exciting, and most importantly, it’s entertaining. Sometimes there’s very farcical elements that are just ridiculous reminders that you’re watching a movie and not real life, but each of the stories are warming. The way John Milner just drives around draws you in. The strange happenings between Terry the Toad and the Debbie he picks up are hilarious, and Ron Howard plays such a pure boy that when he gets snarky it’s a real shock. Mr. Kroot: All right, all right, Bolander, break that up. You know the rules. You and your girlfriend want to do that, go someplace else, huh? Mr. Kroot: Okay, Bolander, you are suspended. Don't - don't you even come in on Monday. You're out, you're out! 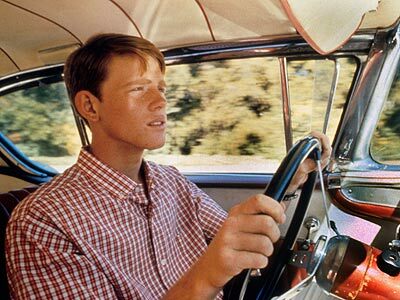 Although there’s the occasional line that I found goes against the grain of what boys that age would do, like moments where they seem to actually CARE about each other’s emotions - as if - overall American Graffiti is a tale of the forgotten innocence of the 60s, of Rock and Roll, of cars and the daily events of a quiet sexual revolution. Add a nice cameo by Disc Jockey Wolfman Jack as himself – if you can call his voice in every scene a cameo – and it’s a well-rounded picture with a lot to say about youth and summertime pleasure. The chicks are on roller skates! My least favourite moment was the very last minute, a little text recap of “where they are now” in that Animal House way. I didn’t need to know what came of their lives, and rather than leaving with a sense of nostalgia, my mood was shattered with what I consider an irrelevant weight of the harsh reality that the happy-go-lucky group ended up being a part of 30 years later. Oh lookit that, another one down on the AFI Best 100. 1001 Movies You Must See Before You Die | 1970-1979 | 70-82% | AFI's Top 100 | American Drama | Americana Classics | Comedy | Drama | Romance Submitted by Squish on April 17, 2012 - 6:13pm. Submitted by SJHoneywell on April 17, 2012 - 7:28pm. Our two thoughts are as one here--the pop-up at the end is a sour finish to what is otherwise a completely enjoyable film. Submitted by STinG on April 18, 2012 - 1:09pm. Actually, I found the coda appropriate. Throughout the movie, the characters were all carefree and joyous, but they were going nowhere fast and they all sort of recognized this. Richard Dreyfuss and Ron Howard's characters actually were going to leave their home to be somewhere. So when the four of them actually make their decision on where they're going (in an attempt to keep this from being spoiled, I won't say who leaves), the coda shows that while the ones who stayed remained in a dead end they set for themselves, the ones who left actually lived a fulfilling life and probably saw the world with it. Submitted by Haricharan on June 6, 2012 - 2:39pm.